The center phone number in the chart shown above is the target of the investigation. The highest frequency of calls are to the right, starting in the circle at position 12:00 noon and decreasing as you go clockwise. 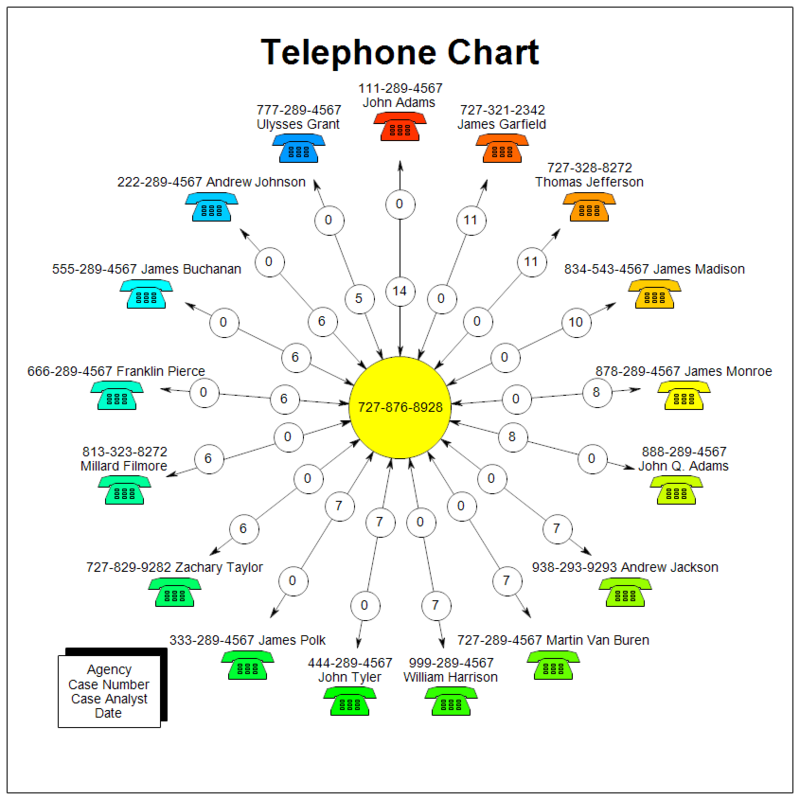 You can select to show only a certain number of calls to make the chart more readable. The outer circle has the number of calls made from the target to the outer phone. The inner circle has the number of calls made from the outer phone to the target. Once RFFlow is installed, you can open the above chart in RFFlow by clicking on telephone_sample.flo. From there you can zoom in, edit, and print this sample chart. It is often easier to modify an existing chart than to draw it from scratch. To draw this chart without downloading or generating it from the data, run RFFlow and click on the More Shapes button. Scroll to the Criminal Analysis folder and click the plus sign to open it. Then click the Telephone Analysis stencil and click the Add Stencil button. For free training in criminal analysis, see mctft.org.